Today's installment in the "A Copa Con..." series is an Englishman made good in the French side of Basque Country. Well, if not made good, at least MAKING good (great) beer. 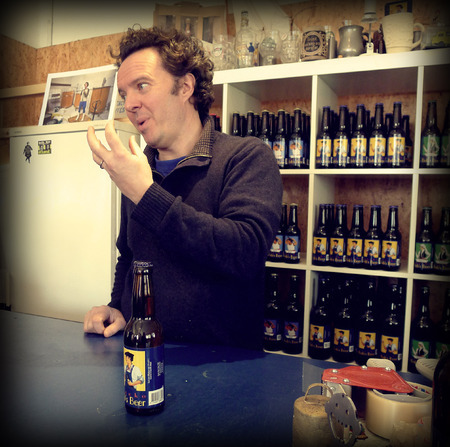 Bob Worboys is the founder, head brewer, driver, office manager, and any other titles you care to invent at his business Etxeko Bob's. It's truly one of the only artisan microbreweries in the area, and it's growing slowly but surely in the small French village of Hasparren. I make beer. I founded Etxeko Bob's about seven years ago. How did you end up brewing, when your career had you in the marketing/TV industry in England? I got very drunk one night, and I woke up and I was here. No, just kidding. I fell in love with the Pays Basque. I wanted to actually do something where you're working with high-quality raw products, to add value. Can you compare beer making to, say, winemaking? If you look through the chain, it's more, especially in terms of raw materials, than grapes. It's a continuous activity. We're producing all year. Right now we're trying to build up stock for the summer. Is there a secret to brewing beer? You're only working with four things: malts, water, hops and yeast. At the end of the day, I hate to say it, but it's true: beer is 90% water. When I first opened I didn't talk about 'the water comes from the mountain' because I didn't think it was important. Because you can modify water. Before, long ago, it wasn't safe to drink. What's it like, being a producer in the Basque Country? There is a huge sense of pride in things that come from this area. If you're producing a locally made product, you'll have, to a certain extent, a market. So has it been smooth sailing since you began seven years ago? No. Because all beers here are so homogenous, you would just order a beer. People would say to me, 'the problem with your beer is it's got too much taste'. Would you change anything about your journey? The reason I came here is because I like the Basque Country. Five years was when I really felt I turned the corner. It's complicated at the moment, with the economy. What's exciting right now for Etxeko Bob's? At Mugaritz I worked with them on a menu. I began to think: how can we find alliances? How can we find things that go with this beer? We got right back to the basics. Rather than trying to match a beer with a dish, let's look at developing dishes with ingredients you use to make beer. You're building awareness, and everybody wins. Thanks to Bob for the wonderful visit and interview. Leave us a comment on the above topics, and if you're in the area, you've got to try his beer!